THEN they will put 100% of what we spend on efficiency upgrades! The long-awaited hippest social movement around, Carrotmob, has finally come to Victoria. This October 24 on Global Climate Action Day, Small Feet, Carrotmob, and 350.org have teamed up to achieve one goal: The transformation of one local business, chosen by you, into a champion for the environment! We all showed up, increased the shop's revenue by 70%, and as a thank you, they added 100% of revenue from a SECOND location! 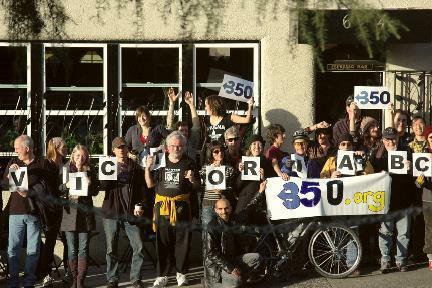 Go 350.org community and our global day of action!